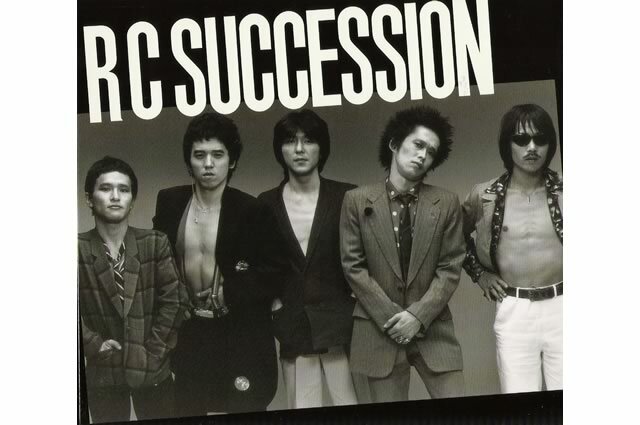 RC Succession are perhaps Japan’s longest-running active band, although it has gone through many changes over the years. The origins of the group’s name remain obscure, but according to some it is a mispronunciation of an in-joke among the band members. The group first started as a Tokyo-based folk trio in 1966 when leader Kiyoshiro Imawano was still in junior high school and playing in a Ventures copy band. The group is hard to classify, but in early years their sound was mostly R&B fashioned music played acoustically. Imawano, however, has quite a distinctive high warbling voice that is not typical of soul singers, and which frankly some people find annoying. More than a singer, he is known as a lyricist for his clever and timely lyrics. RC Succession developed a reputation early on as a strong live band, but did not have a hit record until 1972, and then not again for a long time after that. In the late 70s the group took on a more electric sound, as well as an odd glam influenced look, with Imawano in particular often appearing in loud clothing and heavy makeup. The group became part of a hot late 70s scene which includedYellow Magic Orchestra, The Plastics, and Sandii & The Sunsetz, created when these groups began interacting with foreign bands and releasing internationally. RC Succession did not catch on internationally as much as some of the others, but they did take part in a famous concert in 1982 called “The Day of R&B”, which took place at a packed baseball stadium and included as headliners Chuck Berry and Sam Moore of Sam & Dave. The event was filmed and released as a video. Another thing in 1982 that helped establish them as a major act was a collaboration with Ryucihi Sakamoto called “Ikenai Rouge Magic”. The single’s jacket and promotional picture featured Imawano and Sakamoto kissing – quite a shocker at the time. The song was also used in a popular TV commercial. Among the best-known RC Succession songs are “Ameagari No Yozora Ni” and “Toranjitsu Rajio”. RC Succession have often collaborated with other artists, and Imawano marks among the highlights of his career working with his heroes Booker T. & The MG’s. RC Succession are also unusual in that for a Japanese pop band they are fairly political and outspoken. They are one of the few Japanese bands that regularly play benefits, and Imawano has spoken out against war, nuclear power and in favor of Tibetan freedom. In 1988 the group recorded an album of cover versions of famous songs re-worked with Japanese lyrics, called Covers. Among them was a version of Eddie Cochran’s “Summertime Blues” with anti-nuclear power lyrics. Their record label at the time, however, was Toshiba-EMI, and given that Toshiba had nuclear related business they refused to release the album, which eventually came out on Kitty Records. Johnny Thunders of the New York Dolls also appeared on this album on a re-make of “Eve of Destruction”. Imawano also stirred up controversy when he formed the side project Timers (slang for marijuana), and did a rock version of the national anthem “Kimigayo”. Imawano seems to have many interests and hobbies. He has written children’s books and is widely known as a big bicycling enthusiast. He has also dabbled in acting, appearing in the movies Otakus in Love in 2004, and in Takashi Miike’s film The Great Yokai War in 2005. He has been one of the most frequent performers in the history of the Fuji Rock Festival. Since the festival began in 1997 he has appeared in 1998, 1999, 2002, 2004, 2005, and is booked for 2006. He famously rides his bike to the festival’s mountain setting.